Monarch Air Group provides private air charter in Nice, France. Our clients benefit from top-notch service, unrelenting dedication to safety, wide selection of aircraft, and years of experience in chartering private jets. To obtain a free quote, please use our online quoting tool provided below, or call toll free 1-877-281-3051. 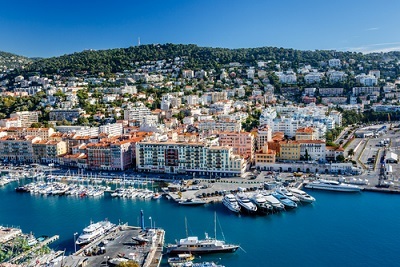 Monarch Air Group offers private jet charter services to and from Nice, France. Situated along the Mediterranean Sea, Nice is the fifth largest city in France and considered by most to be the capital of the Riviera. Offering tourists some of the best shopping and eating in France, Nice boasts narrow lanes, charming markets, cafes, and bakeries. With almost perfect weather and sunny beaches the city of Nice attracts visitors from all over the world. The most popular tourist attractions include the Villa Arson, the Musee des Beaux-Arts, The Cathedral Ste-Reparate, the Albert I Garden, and the Chapelle de la Mis’atricorde. 1. ALL, Albenga, Albenga, Italy. 2. BAE, Barcelonnette, Barcelonnette, France. 3. CEQ, Mandelieu, Cannes, France. 4. CUF, Levaldigi, Cuneo, Italy. 5. FRJ, Frejus, Frejus, France. 6. JCA, Croisette Heliport, Cannes, France. 7. JLP, Juan Les Pins, Juan Les Pins, France. 8. LTT, La Mole, Saint Tropez, France. 9. MCM, Fontvieille Heliport, Monte Carlo, Monaco. 10. SXD, Sophia Antipolis, Sophia Antipolis, France. 11. TLN, Le Palyvestre, Hyeres, France. 1. Casino Palais Méditerranée, 13 Promenade des Anglais, Nice. 2. Casino Palais Méditerranée, 13 Promenade des Anglais, Nice. 3. West-End, 31 Promenade des Anglais, Nice. 4. Hôtel New York, 44 Avenue du Maréchal Foch, Nice. 5. Carlton, 26 Boulevard Victor Hugo, Nice. 6. Hôtel Masséna, 58 Rue Gioffredo, Nice. 7. Le Meridien Nice, 1 Promenade des Anglais, Nice. 8. Roosevelt, 16 Rue du Maréchal Joffre, Nice. 9. Beau Rivage Hotel et Plage, 24 Rue St François de Paule, Nice. 10. Casino Palais Méditerranée, 13 Promenade des Anglais, Nice.